Saint Joseph Academy is pleased to announce the addition of four new members to the Academy’s Athletic Hall of Fame. 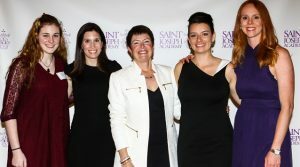 The Hall of Fame Class of 2019 is comprised of Katie Berry ’07, Katie Lehane Koehl ’06, Kate Rybarczyk ’02 and Colleen Gallagher Thomas ’82. The four inductees will be honored at the Hall of Fame induction ceremony on Saturday, April 27 at Saint Joseph Academy. Click HERE for ticket information. Katie Berry ’07 was a four-year varsity letter winner in basketball and was a four-time Most Valuable Player (MVP). During her time at Saint Joseph Academy, she was named All-District three times. She served as a team captain for three seasons and earned All-Ohio Honorable Mention Honors her Senior season. She played collegiately at Walsh University and is set to be inducted into the Walsh University Athletic Hall of Fame this spring as well. At Walsh University she was a 1,000-point scorer, named First-Team All-Conference and earned All-American honors while helping lead her team to the NAIA Final Four as a Senior. Her Walsh University uniform was displayed in the ring of honor at the Women’s Basketball Hall of Fame in 2011 to recognize her outstanding play during the 2010-11 season. Katie Lehane Koehl ’06 will join her sister in the Saint Joseph Academy Hall of Fame as Sarah Lehane Walsh ’05 was inducted in 2015. Katie earned 12 varsity letters during her time at the Academy, lettering all four years in volleyball, basketball and track & field. In volleyball, she was a team captain as a Junior and Senior while also earning team MVP honors her Sophomore, Junior and Senior seasons. She also earned Second-Team All-District honors as a Junior and Senior. In basketball, she was a two-time All-District Second-Team selection and was the team MVP her Senior season. As a member of the track & field team, she earned letters all four seasons competing in the sprints and jumps. Kate Rybarczyk ’02 was an outstanding thrower for the track & field team during her time at Saint Joseph Academy. She was a four-year letter winner for the Jaguars and still holds the Academy’s record in the discus with a mark of 129’2″ in 2002. During her Junior year, she finished third at the Ohio High School Athletic Association (OHSAA) District meet to advance to regionals for the first time. She was named the Jaguars’ Most Outstanding Field Athlete that season. She came back her Senior year and earned the track & field team Award for MVP and Most Outstanding Field Athlete. She finished in fourth place at the Regional meet in the discus to advance to the State meet for the first time, where she finished sixth overall in the state. Capt. Colleen Gallagher Thomas ’82 NC, USN was unofficially the first Saint Joseph Academy athlete to play four years of three different sports, lettering 10 times over that span. She was a four-year letter winner in softball all four years while lettering three times in basketball and three times in volleyball. Her Senior year, she was a captain for all three teams she played on. As a basketball player, she earned Honorable Mention honors by The Plain Dealer as both a Junior and Senior while earning team MVP honors and receiving recognition as a GCCGAC (Greater Cleveland Catholic Girls Athletic Association) All-Star her senior year. In softball, she earned GCCGAC All-Star honors and was named team MVP as a Senior. In college, she was a member of the Villanova University Women’s Basketball Team.